HRExaminer Radio – Executive Conversations: Episode #287: Matt Bingham John Sumser speaks with Matt Bingham, the Vice President of Product Innovation and Strategy for Bridge, an employee development suite from the makers of Canvas. 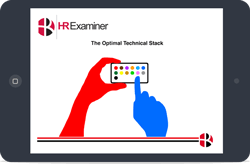 HR Tech Weekly: Episode #184: Stacey Harris and John Sumser. ThinkHR Secures $67.5 Million, Swedish startup Impactpool receives funding, Is There Too Much Diversity Tech?, and 70% of Tech Employees Don’t trust HR. Plus, discussion on #Diversity, #Recruiting, and #HRTech.